As the older and distinguished members of the Positivo Espresso club are virtually all connoisseurs of Italian road racing bike manufacturers (Olmo, Ciocc, Moser, Legnago, Daccordi, Somec, Gimondi…) and know the history of Italian racing idols very well I should probably not repeat it here, but among the many famous figures that left their imprint on the history of cycling, Luciano Sambi was one of the most remarkable. Not that he could count many great victories in his three years as a pro rider with the Italian Legnago team between 1965 and 1967, but he won the Giro di Lombardia and made a 78th place in Milano – San Remo; small victories and founded his fame as „Il geopardo di Ravenna“ as he is still called today in his hometown close to the Adriatic Sea. 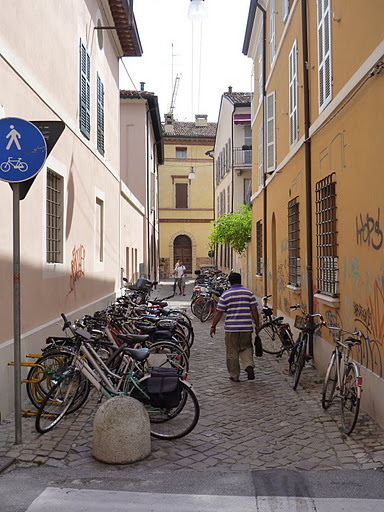 He was further influential in making Ravenna one of the most cycling friendly cities in Italy, or „La Portlando d’Italia“ as it is sometimes called. 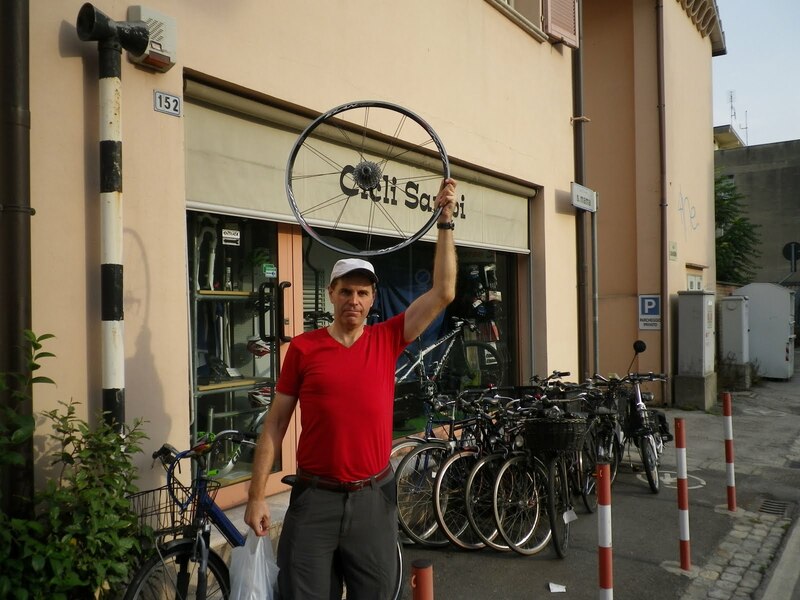 Together with his son Christian Sambi, who worked as a bike mechanic with Nagai-san on the Fasso Bortolo team in the Nineties, he now runs a fabulous bike shop on the outskirts of Ravenna. His prizes and trophies from his racing career are nicely integrated into the shop layout and displayed with pride. Reason enough for David and me to intentionally break the spokes on our rear wheels to find a pretense to visit his shop and ask for his services. We arrived in Ravenna yesterday after a short rest in Arco and a ride along the Garda lake and a lunch of pizza at a cafe high over Lake Garda. 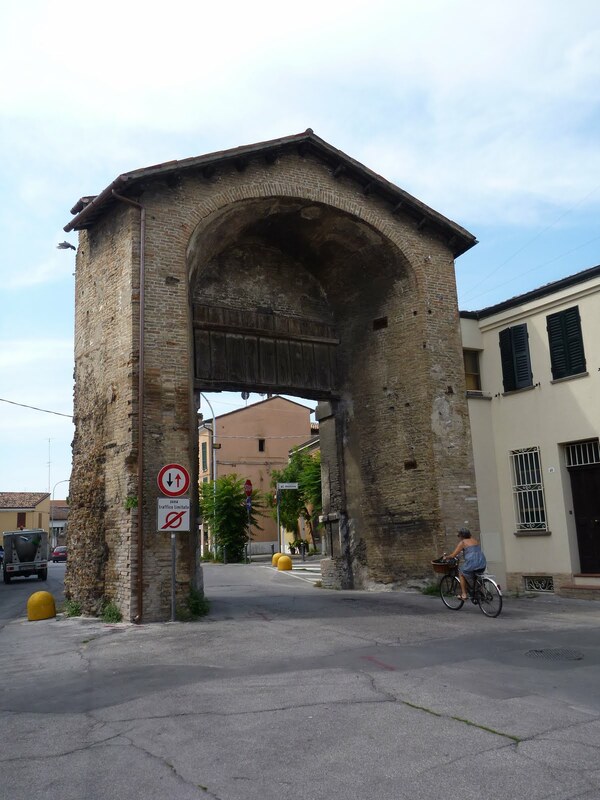 Ravenna is, according to world-travelling cyclist Rick Steves, not a town worth to stay a night but good enough perhaps for a day trip. Apart from this rather harsh statement one might add that the town possesses some UNESCO world heritage sites and is obsessed since the 6th century with producing mosaics. There is even a school where one can learn how to restore mosaics. First thing in the morning we went to the Sambi family store on the Via San Mama 148. 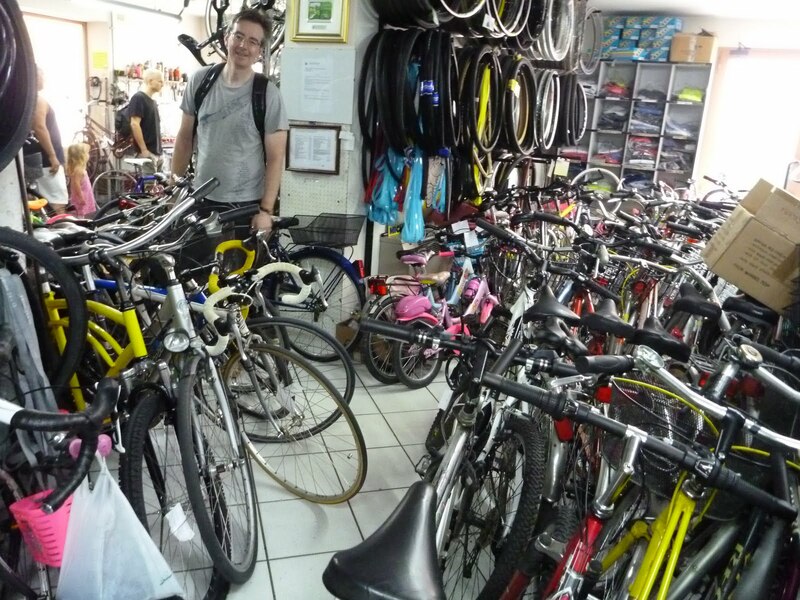 Many nice bikes of all kinds were neatly lined up inside and the whole store was in impeccable order. They had some spare parts on display, like handle bar tape from the Eighties that can be sold for substantial amounts of money as NOS on ebay in Germany. With the eye of a real pro mechanic Christian Sambi took a look at our both wheels and said „Cinque Ora“ which is Italian and means that all of this will take some time to repair probably and anyway there is a lunch break between 12 and 4 so we should come back at 5 when the wheels would surely be ready. Yes, she is the postman on her bike and she doesn’t ring twice. 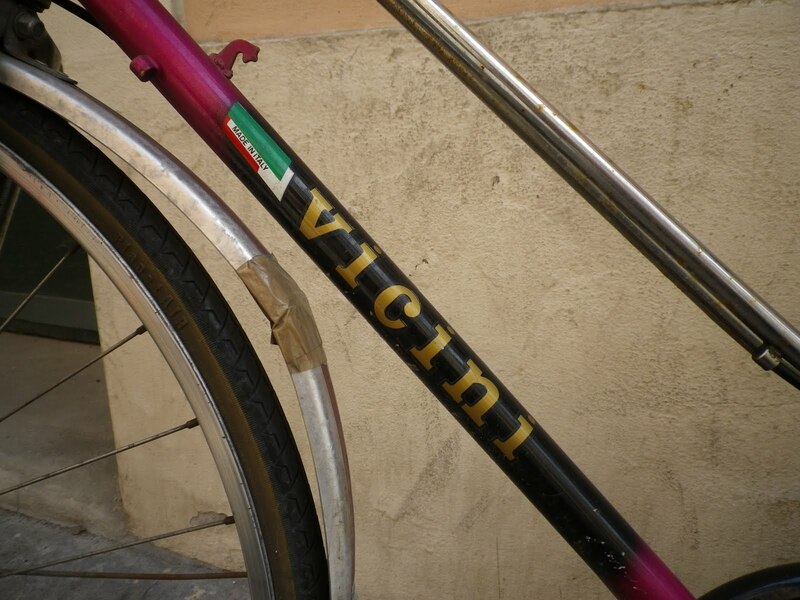 As we had nothing else to do and cycling without a rear wheel seemed somehow too dangerous and complicated, we decided that we should indulge in art and culture and took a look at the Basilica di Ravenna and some other assorted monuments. Art and culture can be very stressful and after a nice and big meal of pizza that ended with a „Cafe Normale“ (which is Italian and means a Cafe Espresso that is extremely small and strong and something else than what Germans would consider as normal when it comes to coffee – and we have Tschibo, Jacobs, Darbhoven and other famous roasters within the borders of our country) we retired to our hotel room where we fell asleep while watching stage three of the Tour de France. About 9 km before the finish all cyclists were reeled in and we could watch Thor Hushovd leading the Garmin-Cervelo train for a sprint victory of Tyler Farrer. A great tour so far for Garmin-Cervelo! After that we headed back to the Sambi shop, only to find our both wheels completely untouched. Our personal presence brought some action and pulled Christian away from other urgent projects and friends who were hanging out and chatting about Italian cycling in the 1960s, and within no time and for almost no money our two wheels were fixed. We cleaned our bikes and made a wheel testing trip to the sea at Punta Marina where we had a good dinner of pizza. 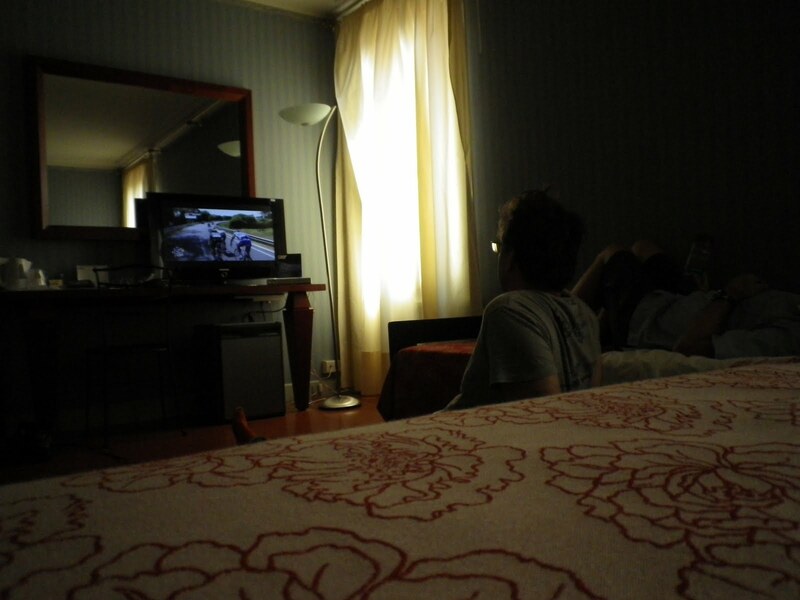 Then we rode back to our hotel in the darkness which was fun. Tomorrow we will continue our bike adventures in the old medieval town of Urbino. Both of us hope that they will have an excellent, stylish and somewhat disorderly bike shop and a good pizzeria, both of which seem highly likely based upon our trip so far.